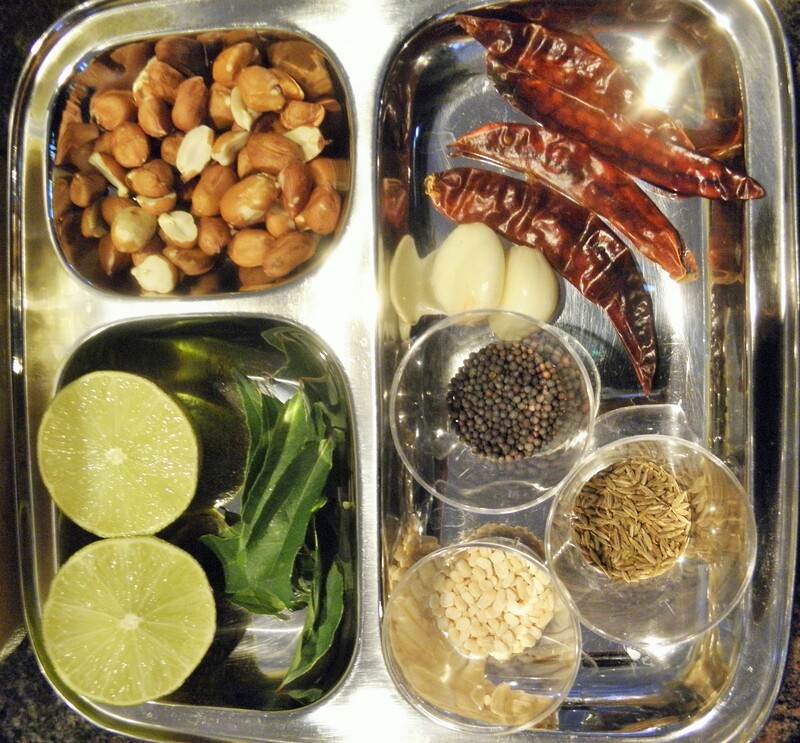 Indian fusion, vegetarian, gluten free recipe! 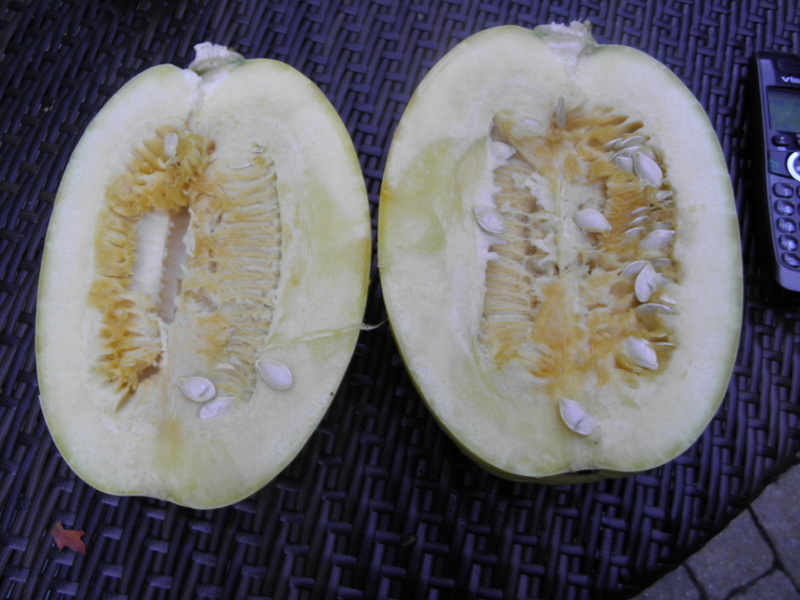 Spaghetti squash never stops fascinating me as one of nature’s amazing marvels! So for my first post for the fall season, I decided to start with spaghetti squash. I got a medium sized one at Trader Joes, which had microwave cooking instructions on the label that said it would cook in 10 minutes on high. 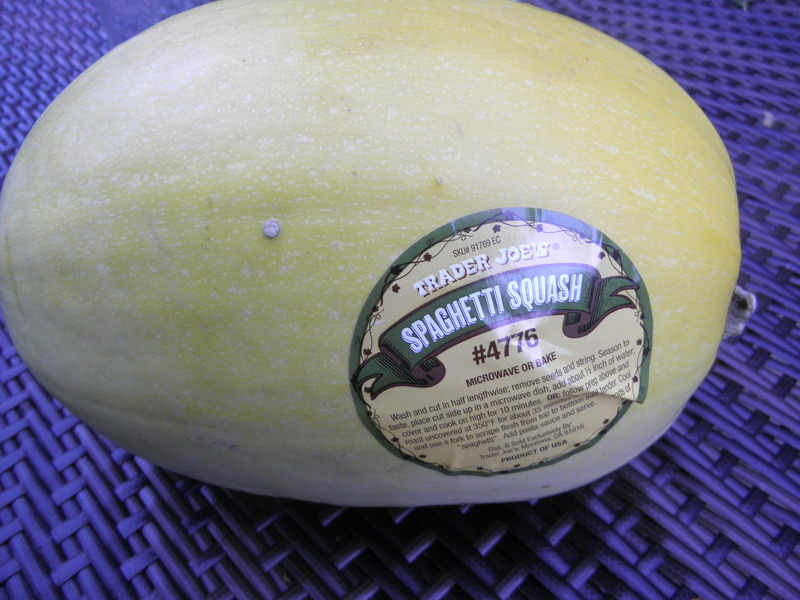 I guess all the spaghetti squashes had the same label, regardless of the size of the squash:) Mine took 25 minutes on high to cook in the microwave but it was easy to do and came out great. I love how the squash retains the spaghetti strands and its texture when cooked. Upma is an Indian dish made generally out of cream of wheat or rice (rava), seviya (very thin wheat or rice noodles ) The lower calorie spaghetti squash packed with nutrition and fiber is also a gluten free alternative! But how does this upma taste, you ask? I love the earthy and slightly sweet spaghetti squash paired with the ‘delicate’ Indian spices in this recipe. The unique aroma of the toasted urad dal , the curry leaves and spices, infuse the squash ‘noodles’ and along with the nuttiness and crunch of the peanuts, create a Scrumptious Spaghetti Squash Upma- a ‘win win’ situation all around! I am lucky to live in a town with friends from various cultures and the array of food at our gatherings is sensational! And while I drool over the Chinese and Vietnamese noodle dishes, my friends love the seviya upma I make, calling them Indian noodles. I am sure they will love the spaghetti squash upma even more, for its unique taste. I chose a medium sized spaghetti squash which seemed pretty heavy for its size. 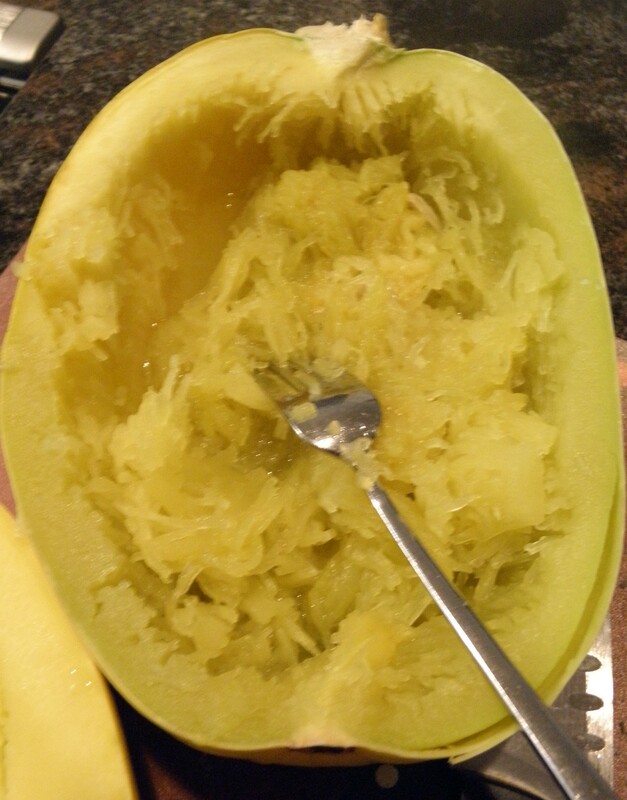 Spaghetti squash cooked in the microwave. Be very careful as you remove the bowl from the microwave as it gets very hot and has very hot water in it too. Set it aside. When it is cool enough to handle, using a fork, scrape the flesh lightly to ‘harvest’ your spaghetti! I got about 7 cups of the spaghetti! Mine were a little watery so I left them in a colander while I did the prep work for the upma. This natures miracle floors me every time! 7 cups of the ‘spaghetti’ from the squash. ( Drain them if they seem watery with the steam condensation). 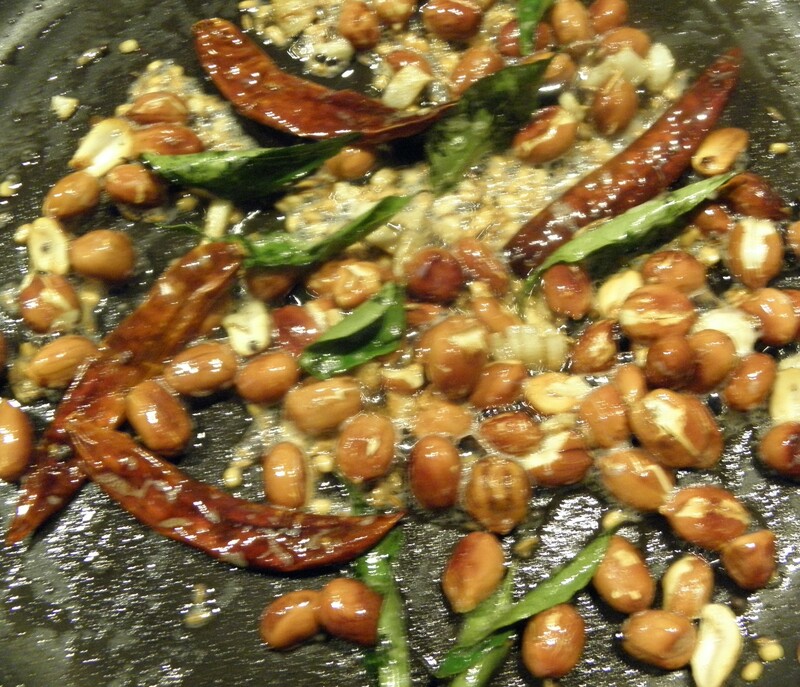 Heat the olive oil and ghee in a sauté pan over medium heat. Add the raw peanuts and let them roast for about a minute or so. Turn the heat to low,Add the urad dal and the minced garlic and stir until both the urad dal and garlic turn light golden but are not burnt, about 30 seconds or so. Add the red chilies ,curry leaves, mustard seeds and cumin seeds and stir for a few seconds until the seeds sizzle and the curry leaves and chilies are nicely toasted. Add the ‘spaghetti’, lemon juice and sea salt and toss well together. 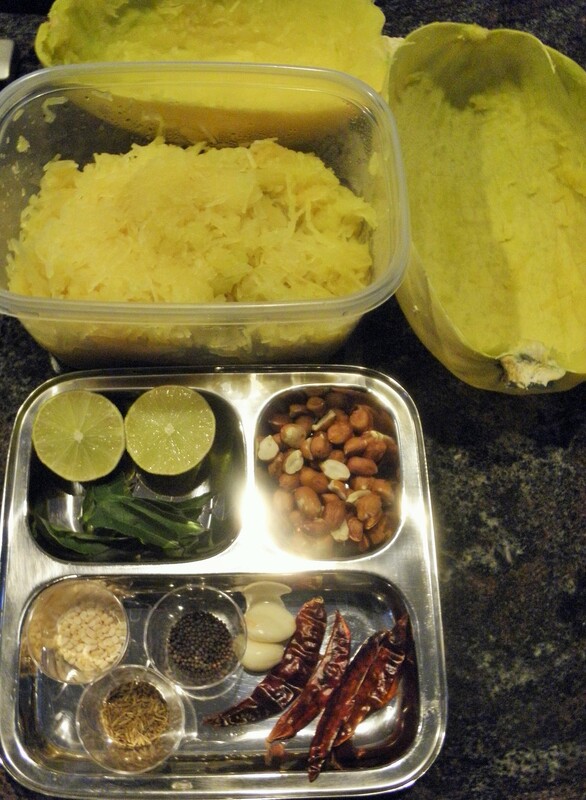 Remove from heat, transfer to a serving container and top with the grated coconut. I used the shell of the spaghetti squash as my serving ware. It is pretty sturdy and I thought it looked pretty in it. What do you think? Sweet recipe!! Thanks for sharing!! XOXO!! This looks so good! And healthy! Thank you for sharing your passion. So wonderful! Thank you Pam! That is so sweet of you. 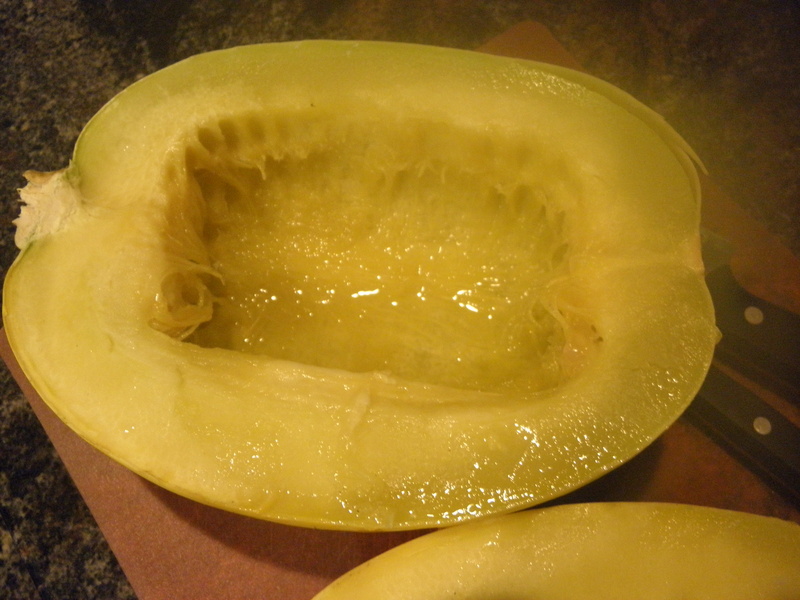 Up until now I haven’t been a fan of spaghetti squash, but I have only had it served to me plain. Using the spices you did could change my opinion of it. I just might reconsider spaghetti squash! Greg, I feel the spices juxtapose very well with the sweetness of the spaghetti squash and the peanut meal adds texture, flavor and protein:) Do let me know when you try it. Thank you for your acknowledgement of my innovative idea and recipe for spaghetti squash upma. I appreciate it. As for how spicy one likes to eat, I leave it to my followers saying “or to taste”. Now Isn’t this a healthy upma? Loved the idea totally and great for people who are on a quest to lose weight and eat wise after all the New Year binging. Great share. I am on that quest Vidya. I made this yesterday and I could eat a huge portion as it is also low calorie. Anything for good health dear. This really is good! Cheers! Do let me know how you like it Ruchi! Hi Sandhya, healthy combination. I too keep trying new recipes where some vegetables are hidden. Creative fusion. Thanks so much Nivedita! Glad to connect with you. Such a genius idea! Spaghetti squash upma sounds really good, Sandhya! Lovely fusion for upma here Sandhya ! Looks tasty. Interesting fusion ! Should make this for H ! Lovely idea! Such an innovative recipe! I love how it looks. Though I am not a fan of regular upma, I might give this one a try.